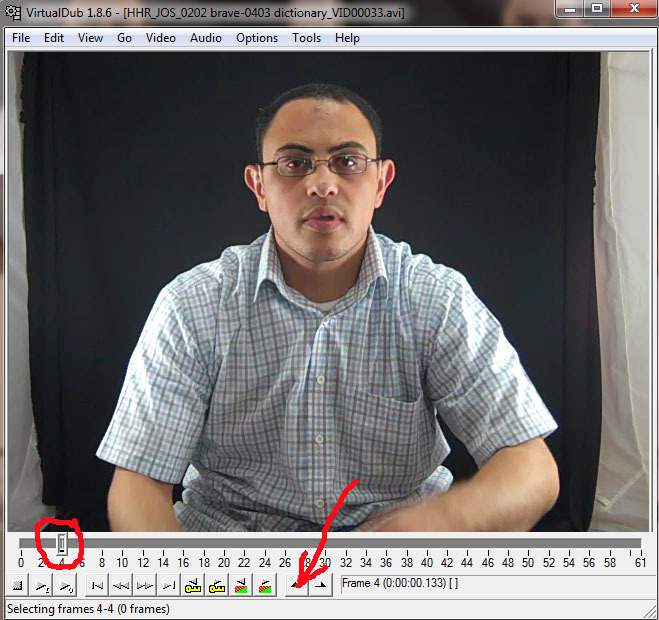 Do these steps to prepare hand sign video clips for input into His Hands Reader after they are filmed. 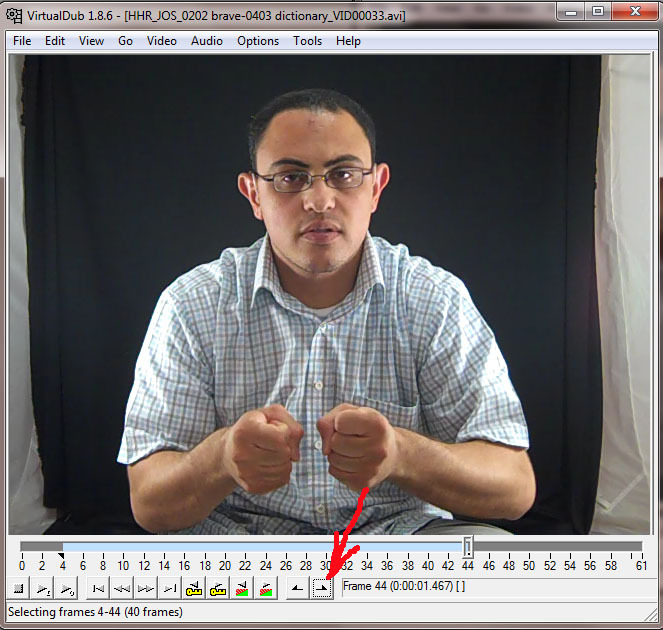 Use the VirtualDub tool to trim the AVI hand sign video clips. Trim off the beginning of the video so that the video begins just as the hands start to leave the lap of the hand signer. Trim off the end of the clip where his hands finish the hand sign before starting their return to his lap. Name the hand sign videos to be the name they will need to have to be used by the His Hands Reader program. 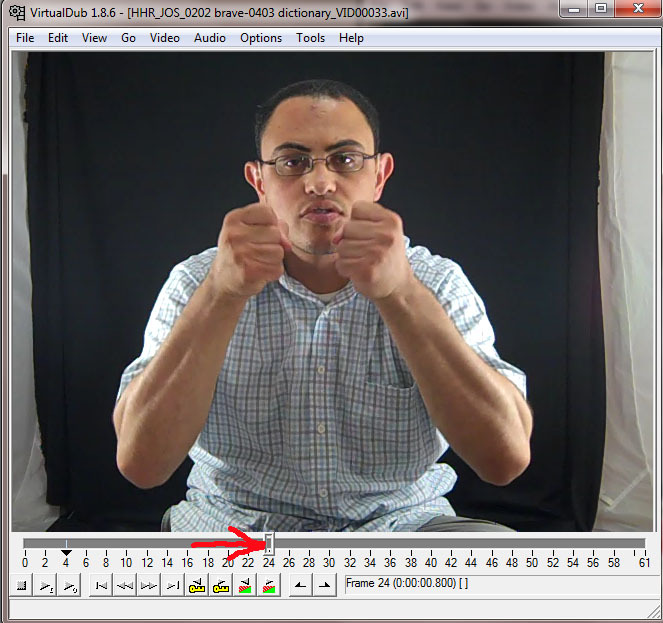 2) Make a directory under the HisHands/bin directory that will contain the hand sign files for the sign language. To do this just copy an existing NEW_Signs sign directory and rename the file NEW_HHRWhiteSpace.flv. Use the three letter naming convention used by the Ethnolog http://www.ethnologue.com/family/17-2 for the name of the sign language as the high level qualifier for the name of the directory and the HHRWhiteSpace file. If there is no official name yet then use the two letter convention for the country name with a number eg. CM1 is used for the Cameroon sign language because it was not yet an official sign language. 3) Copy a list of words from the HHR Word List page of the words you want the sign files to be renamed. Press Explore... button and browse to select all the AVI files you want to batch convert. Note that it runs out of memory if you try more than 700 at a time?? 5) Now place the flv files in the subdirectory (see step STEP 2.2 above) and try reading some text with H1: selected to that hand sign language. You should see those hand signs play.